Guardians of the Galaxy Rocket Racoon 12 Oz. 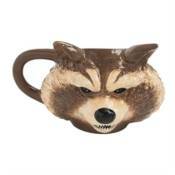 Sculpted Mug:This Guardians of the Galaxy Rocket Racoon 12 Oz. Sculpted Ceramic Mug is custom sculpted and beautifully crafted, bringing to life a unique addition to your collection! Take a sip with your favorite space raccoon from the Marvel Cinematic Universe. This ceramic mug comes packaged in a full colour gift box. Hold up to 16 ounces of liquid.